1915 in Dublin was a quiet year, not much different to any that had preceded it in that regard. The city was still a city of two halves ... or, perhaps, better to say a city of haves and have nots, for it was still a city where those who had lived side by side with those who had not, often literally. The First World War dominated everything of course, and was perhaps the greatest external influence on the people of Dublin that year. Starting in 1914, this war to end all wars was supposed to have been over by Christmas 1914. John Redmond had encouraged his followers to join the British Army and go fight for the rights of small nations and some 150,000 men did just that, believing his promise that things would improve for them and their country on their return. But the war was not over, and now the dreadful cost was being seen everywhere as casualties returned, minus limbs, minus eyes … minus life. The war was striking home, the awful reality, and recruitment had slowed. The British Government, our government, was considering conscription in Ireland – the forced recruitment of able-bodied men into a war most now did not want to take part in. Some, of course, had not followed Redmond but had stayed loyal to their own dream of a country with the right to determine its own future, its own alliances, and were actively planning for that, under the ever-watchful eye of the Secret Service. Just across from the Rotunda, in Great Britain or Parnell Street, was a small tobacconists and newsagents run by an old man. He was Tom Clarke, an ex-prisoner, out on license. He could do nothing overt for fear of breaking his terms and being re-imprisoned. So he sold newspapers and tobacco to all who wanted them. Through the streets of Dublin armies marched at weekends, to the sounds of mockery from most of Dublin’s residents. industrial dispute the fallout from which was still being felt in 1915 with many, many men still unable to find work … other than in the British Army. The Irish Volunteers marched too, in their often mismatched uniforms or no uniforms, with their wooden guns and hurley sticks – route marches, mock attacks, to the constant amusement of those who watched. It seemed they were now a spent force, only a small shadow of what they had been, the vast bulk of their members gone to war for Britain and the rights of small nations on Redmond’s instructions. Na Fianna Éireann – young boy scouts under the implausible direction of Bulmer Hobson and socialite Countess Markievicz – trained in survival crafts … and use of arms. Cumann na mBan – the organised women – marched and trained too, learning first aid, codes, shooting, loading rifles etc. in preparation for the day they believed would soon come when they and their male colleagues would fight for Ireland – and women’s – freedom and pride, bringing equality for all. But most people in Dublin went about their ordinary business and lives as they always had. Those who had jobs went to work, earned their pay and came home again. This workforce, though, was different, was changing. With so many men away at war, women were now expected to join the workforce to keep the wheels of industry turning, to toil in the shell-making factories and others for the war effort, for a fraction of what their men would have earned. But they were working, and were appreciated. These women now had money in their own pockets, their own money, and could enjoy their free time as they wished. No-one really saw what was happening – women doing the work of men for less money. What would happen when the men returned? In an era when almost all entertainment was live, these workers, men and women, went to dances, to concerts, to operas, to orchestra recitals, to the theatre, to sporting occasions. The people took music lessons, they sang. the 1798 United Irish Rebellion – attended places like the Abbey Theatre, the Father Matthew Hall, The Rotunda – famous as the place where international artists such as Lizst and Paginini had in the past performed in this, the second city of the Empire. We had our by now annual Feis Ceol – a competition for all things musically Irish. Plays, concerts and music soothed and inspired their audiences. Unknown to them, some of the cultural life of the city was being controlled by those who would free even those who did not yearn to be free. Patrick and Willie Pearse, for example, wrote plays with Irish themes, in both Irish and English, and performed them in the Abbey and the Fr. Matthew Hall among other places … plays to remind the people of their heritage, their Irishness, their nation’s fall from greatness. The Pearses, through their innovative school St. Enda’s in Rathfarnham, were teaching the younger generation about their glorious past, and their right to determine their own future. Through organisations such as the Gaelic League and The Gaelic Athletic Association, Irish music and sport were flourishing. Michael Mallin, ex-British soldier and a leader of the coming rebellion, had played the drums in the army and was an accomplished flautist. Eamon Ceannt was a champion uilleann piper and founder of the Dublin Society of Pipers - Cumann na bPíobairí. There were regular concerts in Liberty Hall, where all could meet under apparently innocent cover. Beneath the surface, out of sight, was the other side of the city – the poverty, the grinding awful poverty. Slums filled to overflowing with people without hope, dying in greater numbers than perhaps any other capital in the British Empire. Starvation, disease and death were rampant. These misfortunates could not enjoy the theatre, the opera, the concert … their only pleasure perhaps a cigarette or a drink or, on Sundays, to stroll down O’Connell Street on the GPO side and look across the street at the rich and the good as they perambulated on the other side. Even in our main thoroughfare, there was class division. The evening opened open with a plainchant performed by past members of the Palestrina Choir followed by Renaissance polyphony pieces sung by Cantando under the direction of former Palestrina Choir Director Orla Barry. 2015's boy soprano Feis Ceoil winner, Max O’Neill, performed pieces from the Feis Ceol 1915 competition. RTE Concert Orchestra Violinist Sarah Sew played traditional Irish Airs from the Abbey Theatre’s 1915 music programmme (written by the Musical Director John Larchet), accompanied by concert pianist Stuart O’Sullivan. 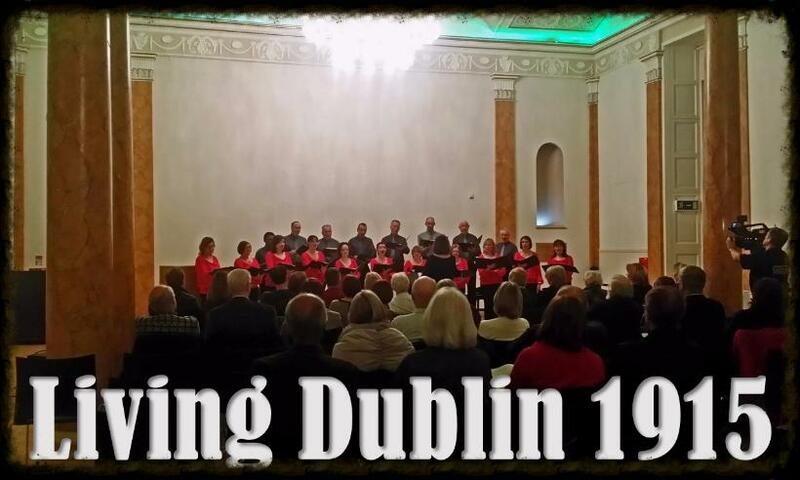 New Dublin band Obtuse then performed traditional Irish music from the pubs and music halls of 1915 and Fair City’s Dave Duffy sang Percy French songs. Mícheál Ó Doibhilín (Kilmainham Tales) gave a short talk (reproduced here), putting the music and times in context. Surplus proceeds from the event went to the Friends of the Rotunda. The sounds of war were far away, but they were beginning to echo here as those who wished for change sensed an opportunity. We grew weary of funerals as our young men returned from that war to coffins. But one funeral above all changed everything. On August 1st, superbly stage-managed by that little tobacconist Tom Clarke, the great Fenian O’Donovan Rossa was laid to final rest in Glasnevin Cemetery. This was the greatest funeral seen in Ireland in the 20th century. It was solemn, dignified, respectful of the dead as all funerals should be but, when Patrick Pearse gave the graveside oration, all changed and there was no going back. Yes, 1915 in Dublin was, indeed, a quiet year, not much different to any that had preceded it in that regard. But Ireland was pregnant with anticipation. Soon she would be delivered of her child …. and a terrible beauty would be born.